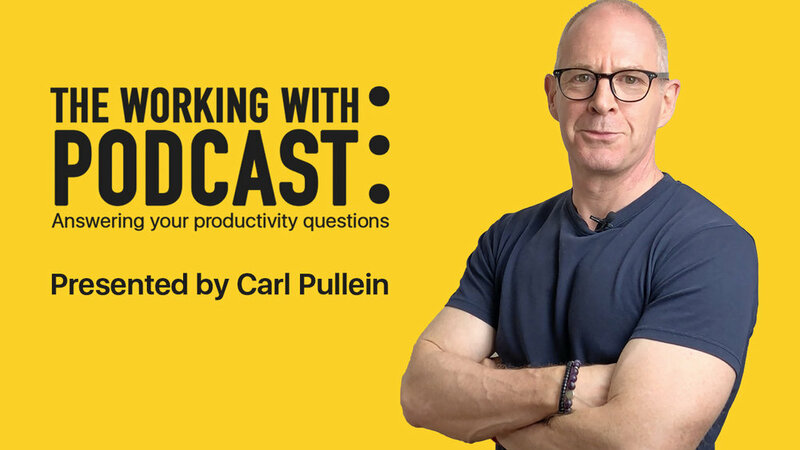 In this week’s episode of the Working With Podcast, I answer a question about Getting GTD to work for you. Hello and welcome to episode 67 of my Working With Podcast. A podcast created to answer all your questions about productivity, GTD, time management, self-development and goal planning. My name is Carl Pullein and I am your host for this show. This week we are visiting the various systems that many of us follow and how to overcome problems when we cannot get it to stick. But before we delve into the question and answer, I’d like to point you in the direction of my YouTube channel. Recently I have posted a few videos that could really help you get clarity and focus on your work and the things you want to get done. In particular my recent videos on creating a daily workflow in Todoist. Although it is focused on Todoist, the principles of building a workflow in whatever to-do list manager you are using will still apply. And last week’s Productivity Mastery video on discovering your North Star is certainly a must watch. Without finding your purpose—your North Star—you will find yourself running round and round in circles are living your life on other people’s agendas and that is never going to result in a good outcome for you. So check them out. I know they will really help you to get better organised and more productive. Okay onto this week’s question and that means in now time for me to hand you over to the mystery podcast voice for this week’s question. This week’s question comes from Jane. Jane asks: Hi Carl, I’ve read all the usual productivity books from Getting Things Done to your book, Your Digital Life and I understand the ideas in all the books I’ve read. My problem is I just can’t get anything to stick and I end up either not doing what I should be doing or just writing things down on random bits of paper. Do you have any advice to help me get something to stick? Ooh that’s a good question Jane and thank you for sending it in. Now, I have come across this kind of problem before and it is more common than people might think. There’s a lot of great books on productivity and time management out there with some very sound advice. The difficulty people often find is getting the principles and methods in the books to stick. The first thing to understand is that the ideas and principles in these books are a set of guiding principles that have worked for the author. In the case of Getting Things Done, for example, creating lists based on contexts (people, places and things) works for David Allen. And for a lot of people organising their to-do lists based on where they are, what tools they have with them and who they are with doesmakes sense. But for other people, myself included, they have never been able to get the context based to-do list to work effectively. When Getting Things Done was first written in 2001, the smartphone as we know and love it today did not exist. If you wanted to do any kind of email work you needed to be at a computer. Likewis,e if you needed to write a report or essay, you also needed to be at a computer. Today, however, I reply to a lot of my email and often start writing my weekly blog on the bus from my iPhone. I do not need to be at a computer or sat in my office. I can do all those things anywhere at any time. Whenever I visit a client’s office or meet up with a student of mine, I always have my bag with me and in there I have my iPad. I can create presentations, build spreadsheets and do video conference calls from that device. Again, I no longer have to be in a specific location to do any of those things. If I were to follow the context based list it would be very difficult to allocate specific tasks to specific lists and I would waste a lot of valuable time and energy trying to figure out where tasks should go. So contexts do not really work for me. However, the principles of collecting everything in to an inbox and processing my inboxes every 24 - 48 hours does work. Ever since I first read GTD back in 2009, that is something I have religiously stuck to and it works 100% of the time for me. In fact, it works so well, I also adopted the same principles for managing my email. My email is zeroed out every 24 hours. In the end, after fighting to get contexts to work for me I gave up on them. Instead, I created lists based on what I felt needed to be done on specific days. The funny thing is I still add contexts to my tasks, in the hope they will one day work, but after ten years I guess I have to accept they are not going to work for me. Last year I decided to begin doing Robin Sharma’s 5AM Club. What this is is waking up at 5AM every morning and following a system of three 20 minute parts. In those sessions, you begin with 20 minutes of exercise, then 20 minutes planning and to finish you do 20 minutes of self-learning. The problem I had here was I prefer doing my exercise in the afternoons and I always do my planning in the evening but I did want to do the learning part. In addition, I also wanted to have some time each day for quiet reflection and meditation. So, I created my own “hour of power” as Robin Sharma likes to call it and do 45 minutes of studying (in my case Korean) and 15 minutes of meditation. I never check email or do anything else—no matter how busy I am—that one hour between 5AM and 6AM is my special, personal time. All these systems and ideas by amazing people like David Allen and Robin Sharma work, but they work for them. What we need to do is to find a way to make the principles they advocate fit in to our lives. I am not David Allen or Robin Sharma. I am me. I work in a different industry, I live in a different country and I work in a different way. And when it comes to the 5AM Club, I will have different biorhythms to Robin Sharma. But that does not mean their ideas do not work at all for other people. They do work. They are build on sound principles and have been tried and tested. What you need to do, Jane, is find a way to implement these principles in a way that works better for you. Let’s take Getting Things Done. The basic principle of getting everything off your mind and into a trusted place is an absolute. If you are not doing that, then you are going to forget something and things will get lost. So creating an inbox either a digital one or a physical one or both, I use both, is a must. I have a metal inbox next to my desk for random bits of paper and regular mail. But for the most part, my Todoist inbox is my trusted place. Anything and everything that comes in to my mind that I want to do something with will begin it’s journey there. I also use my Evernote inbox for articles I want to read or reference materials I collect throughout the day. Next, processing. Now David Allen recommend this is done every 24 to 48 hours. I do this every evening when I do my Golden 10. I go through what I collected and make a decision about what something is and what I want to do with it. A lot of what I collect gets done straight from my inbox. They are often quick messages or sending an invoice. I do not need to put them into a project first. It will take a very small amount of time, so I just get it done (the two minute principle at work here—if it can be done in 2 minutes or less do it now) I then move in to my 2+8 Prioritisation system. This is where I plan tomorrow by selecting two tasks as my objectives for the day—the two things I will get done no matter what…well except for extreme emergencies, and the 8 other tasks I would like to focus on. Now, the Golden 10 and the 2+8 Prioritisation system are not part of the GTD book. They are things I created to focus me in on what I decide is important to me. Now throughout the day, I do not work from different contexts, like home or office or computer etc. I work from my Today’s Focus list. This is a list that contain the ten things (2+8) I want to get done that day. What I have done is created a system that works for me, that was built on the foundations of GTD, but modified so it fits better for the way I work. What I am doing is collecting, organising at the end of the day and the rest of the time I am doing (my COD system—collect, organise, do) and that is what you should do too, Jane. Find a system amongst all the ideas you have read about that work better for you. Now, some people have challenged me and said that because I am not following GTD exactly as it is written in the book, or because I do not follow the 20/20/20 principle of the 5AM Club (exercise, plan and study) then I cannot say I am a GTDer or a member of the 5AM Club. Okay, then I accept that. But what I see is I get the same benefit and the same outcome as I would if I were to follow the principles exactly as they are set out in the books, but I am doing it my way. A way the works better for me and fits better into my way of life. I still plan my day, I still exercise (actually I exercise for more than 20 minutes per day) and I still study. I also still capture everything that comes across my mind, I still process and organise those thoughts and tasks and I still do a weekly review every week. So, Jane, and for all of you listeners out there. Whenever you learn a new system or a new way of doing something from a book or a video or a course, remember always to adapt it for the way you live. How you do something is less important than the outcome you get. If you prefer collecting your ideas into a little pocket notebook and transferring them over to a digital system every three days or so, then great. As long as it works for you. Likewise, if you don’t like waking up at 5AM and prefer to wake up at 6AM and do your planning and self-development study then exercise in the evenings, then great. Do that. If it works for you, you are still planning, exercising and developing yourself. You still experience the same benefits in the long-term. I have always been inspired by Stephen Covey’s quote “begin with the end in mind” - meaning begin with the outcome you desire and work backwards. If you want to be healthier, wiser and better focused on what you want, then giving yourself enough time each day for exercise, planning and learning is what matters. Waking up at 5AM is just one way of doing it. Likewise, if you want to get yourself better organised and more productive, then collecting everything on your mind, organising what you collected regularly and spending the majority of your time doing the work is how you will get there. You don’t have have contexts attached to every item in your list. How you collect and organise your ideas, events and tasks is up to you. Find a way that works. I hope that answers your question, Jane and thank you. Thank you also to you for listening and I do hope you got a lot out of this episode. Don’t forget if you have a question you would like answering, you can email (carl@carlpullein.com) or DM me on Twitter or Facebook.